This is the exact same plot, only instead of a density estimate I’ve used a simple histogram (yes, yes, I know, a histogram is a sort of density estimate). 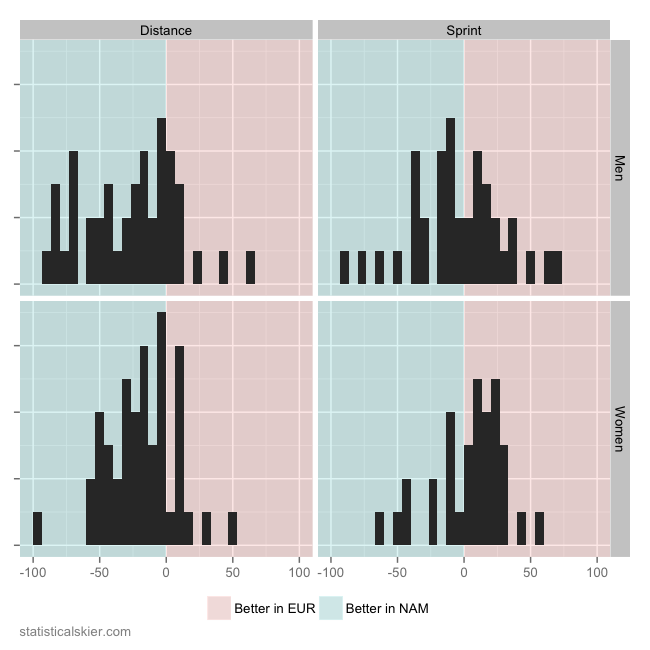 I suppose if you wanted to get all shamanic and read the tea leaves on this, you could argue that the four short bars on the extreme left of the men’s sprint panel argues for a less symmetric distribution than the density estimate showed. But I think we’re splitting hairs at that point. The sample size here is what I’d call medium-ish, at around 75 individuals for the men’s sprint panel. I think the best argument against what I posted last week is not that the distribution appears remarkably symmetric, but that perhaps my choice of smoothing parameter for the density estimate (in truth, I simply used the defaults for my software) were perhaps a bit….aggressive for 76 data points. Later in the week I’ll update this with a look at how these values have changed from season to season. Posted by Joran on Monday, October 7, 2013, at 6:03 pm. Filed under Analysis. Tagged Analysis, canada, fis points, US. Follow any responses to this post with its comments RSS feed. You can post a comment or trackback from your blog.